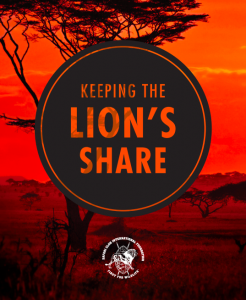 PTH - HSUS Busted for "Keeping the Lion's Share"
A report issued last week by Safari Club International Foundation (SCI), "Keeping the Lion's Share," refutes a study released by four different animal rights organizations in which they request that the U.S. government add African lions to the endangered species list. SCI's report does an excellent job calling into question just how much trust should be placed in animal rights groups like the Humane Society of the United States (HSUS), Humane Society International (HSI), International Fund for Animal Welfare (IFAW), and Born Free USA. In the age of "studies" and "findings", sometimes it's good to step back and evaluate who's behind it and why. "These groups aren't doing a whole lot of work on the ground to help African communities." "The animal rights groups raise a pretty penny by ginning up one complaint after another. But, they are hypocrites, plowing the money into bloated overhead rather than into science and the conservation of African wildlife." Animal rights groups rarely tell the full story. Much like the world's best illusionists, HSUS makes sure you only see what they want you to see. The single photo. The doctored video. They don't show you everything, because that's not what brings in the money. Alexander N. Songorwa, Tanzania's highest-ranking wildlife official, wrote in a New York Times article, "odd as it may sound, American trophy hunters play a critical role in protecting wildlife in Tanzania." SCI reported the true facts about the economic impact hunters and conservationists have on African wildlife management programs. Their report indicated that between 2008 and 2011, hunting generated $75 million for Tanzania's economy. HSUS, Born Free USA, and the other animal rights groups don't realize that the very laws and policies they work to pass would often have unexpected consequences that are counterproductive to their stated goals. While HSUS and others spend money on fundraising campaigns with little to show in the way of actual support for African and its lion population, Safari Club International has already spent $1.1 million dollars and recently raised $1.4 million to promote conservation efforts for the African lion. SCI is "committed to responsible management of the wildlife populations and funds the annual African Wildlife Consultative Forum." We encourage you to learn more about the Safari Club International Foundation through their Website, Facebook, and Twitter! To see SCI Foundations full report, click here.